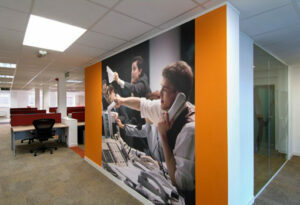 You may take it for granted, but the physical layout of your call centre can have a big impact on performance. Darren Woolstencroft looks at six clever ways to lay out your call centre. Having worked in contact centres for several years before joining workplace design and fit-out specialist TSK, I’m well aware of the challenge of keeping people happy and productive in this environment. Below are six examples of ways in which some call centre have adapted their buildings to help boost both performance and retention. Transparency is important in most business relationships. 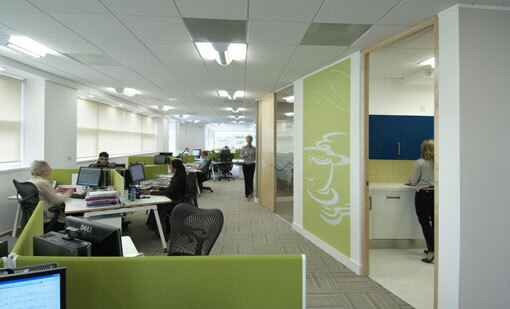 When working with major outsourcing business Ceridian at its Glasgow-based headquarters building, rather than shutting their call centre floor out of sight, they wanted to build a glass wall around it to keep its people in view of visiting clients. This feature can also help to break down the sometimes subconscious ‘them and us’ barriers that emerge between the call centre floors and their colleagues who need to work in a more traditional office-based environment. Every contact centre is a community in its own right, and as such, communal areas have an important role to play. Be it a kitchen or fully functioning cafe, these open plan spaces draw in people from disparate areas of an organisation, and bring them together to encourage valuable face-to-face communication and interaction. 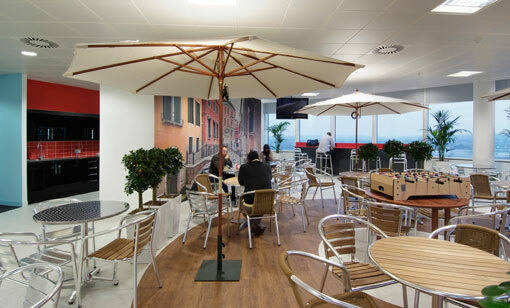 Travel company LateRooms.com designed a large communal area at its new Manchester-based headquarters, with a Mediterranean piazza theme. While reflecting its brand aesthetic, the piazza has also become the beating heart of LateRooms.com’s offices, allowing social networks to flourish and maximising the potential for the cross-pollination of ideas between people, teams and departments. Training and development is essential in getting people to be good at what they do. For outsourcing businesses, an investment in training is testament to its commitment to maintain a quality service. It is their people that are the first point of contact for their clients’ customers, so they need to prove they are highly trained and skilled. While it’s appropriate that training areas have a degree of privacy to help create a quiet atmosphere in which effective learning can take place, there is no need for them to be shut out of sight. 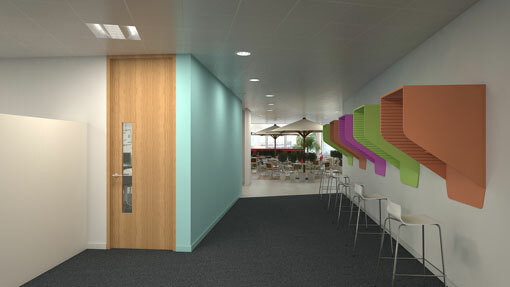 LateRooms.com opted for an open training facility built around its contact centre. While helping provide a more dynamic learning environment situated in the heart of one of its busiest floors, it also serves as a constant reminder of the support the business provides its employees. The term ‘contact centre’ hasn’t evolved purely out of the industry’s need to shift perceptions of itself. It reflects an increasing professionalisation of an often under-appreciated sector. There has been a transition from factory-style, process-led work to a service-based offering that aims to resolve issues and solve problems. By the same token, there is a need for people to have the flexibility to quickly match the changing commercial objectives of their own employer. Contact centre environments need to reflect this shift in culture. Teams are fluid, being created as quickly as they are dissolved and so people need to have the freedom to move wherever and whenever they’re needed. At the same time, with many centres being open to serve all hours of the day, ‘owning’ a single desk is not practical. 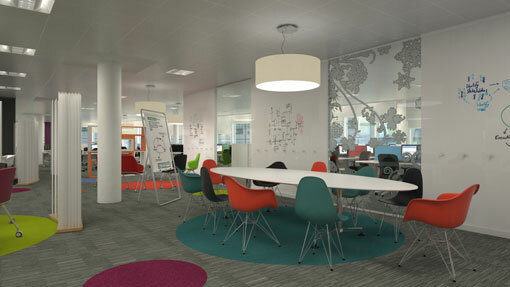 Hermes, one of Europe’s largest home delivery specialists, created a workplace that is a bright and open space. 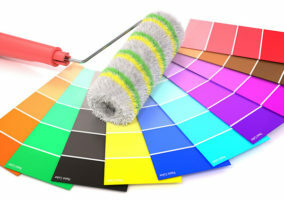 This provides a quality of environment that will help motivate its employees to play a vital role as brand ambassadors. Contact centres are busy and, at times, noisy places which necessitate the need for quiet places where people can meet one-to-one, in their teams, or to take and make challenging or private calls. But these are events which can happen at short notice, so spending time scouring the building for a quieter place can quickly interrupt the flow of work as well as waste valuable time. The ability to gather quickly in a pod for a team meeting, or to make a quiet phone call keeps people focused and ensures that essential conversations can take place with a minimum of interruption. Operating around the clock, many contact centres are places where people spend long periods often outside the traditional nine-to-five working pattern. So, perhaps more than anything else, these need to be places where employees feel comfortable with their surroundings in order to get the best out of them. Ask them how they feel about their current work setting and typically responses will focus on two things – light and temperature; ‘it’s too hot’, ‘it’s too dark’. Call centres are a space like no other. These are places with quiet areas but also busy training centres and social spaces. 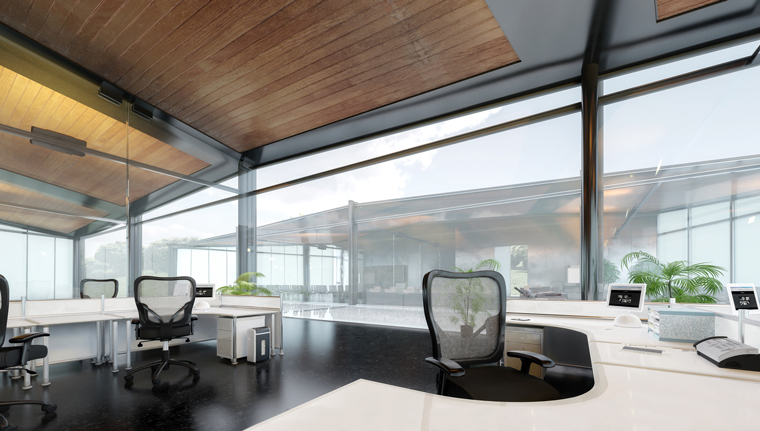 They can constantly adapt to match the ever-changing structures of working, but they can also be comfortable places to spend long periods of time. Click here to find out if Your Contact Centre in Need of a Re-Design? Tell us about the design of your call centre in the comments below. Damn good stuff!!!! Specific and direct, love it. i really like the look of the canteen. relaxing and modern, almost like the Waterfront pubs and bars in Nottingham. How do I improve call centre process functions?